Matt Cutts Keynote at #Pubcon Las Vegas 2013 - Bruce Clay, Inc.
Search Marketing » Bruce Clay, Inc. Blog » Matt Cutts Keynote at #Pubcon Las Vegas 2013 - Bruce Clay, Inc.
Matt Cutts asks the Vegas crowd at 9 a.m. how we’re doing and there’s a rousing cheer. That shows the level of interest this webmaster audience has in hearing Matt, what’s going on with Google and what direction Google is moving in. He’ll start with moves over the last year. 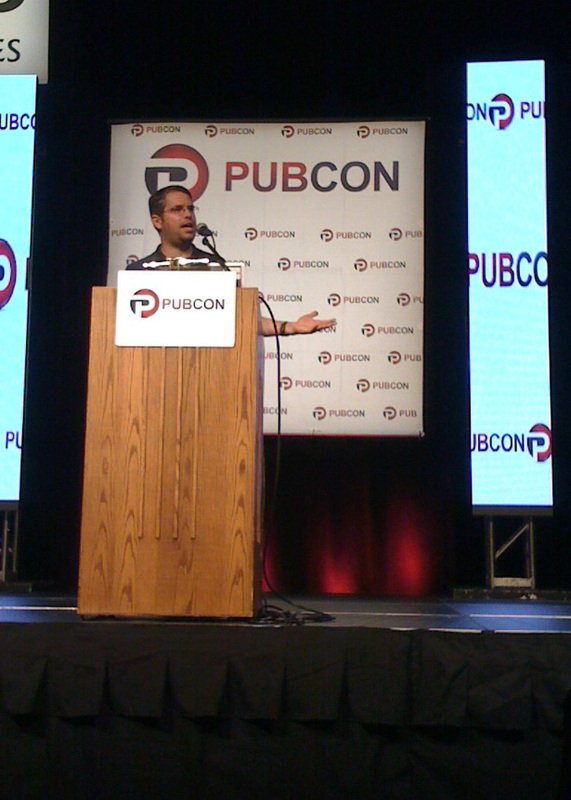 Matt Cutts presents a keynote at PubCon Las Vegas 2013. You can voice search “Who is the prime minister of Turkey?” – and Google knows Turkey is a proper noun here because of Knowledge Graph. It will give you the answer. Then you can say “how old is he?” and it will give you the next answer. That’s Knowledge Graph, voice search and conversational search working together. Penguin 2.0 and 2.1: At Penguin 2.0 they were really working on a soft landing. A lot of spammers laughed at the release, so Google said, “Okay, we can turn that knob higher…” and that was 2.1. Algorithms for very spammy queries, like “payday loans.” There are spaces where a lot of spam goes on. Continuing action on spam networks: They have a list of items they plan to hit. >100 speaking events, Hangouts on Air, webmaster office hours: There’s a ton of Google people who are attending lots of events and talking about topics online. Dial into office hours because they want to be accessible. How Search Works website: If you’re willing to pay hundreds of dollars to go to a search conference, go to this free site where you’ll see the kinds of spam Google takes action on, and where the webspam team takes the most action. You can even see live screenshots of spam sites they’re taking out, like looking over their shoulder as they fight spam. Over the next few months it’s going to look like Google’s not doing much. They’re going to be working on things no one will see. No Toolbar PageRank scheduled for the rest of the year: The “export” to the Google Toolbar is a pipeline that broke and they decided to just leave it and not staff anyone to revive that pipeline. Mobile: Get ready. Responsive design or m.? Fix your issue of how you’re seen on mobile devices. Learn about requestAutocomplete. Annotate your forms: If you have a form on your website, people don’t like that experience. Having that form makes things more difficult. requestAutocomplete is a standard where you can markup your forms (add an extra attribute to your forms) and sites that support that will let users one-click fill out the form. Ad-heavy pages above the fold. This will have a greater impact on other language sites like Arabic and Russian than English but they’re working on next iteration algos that target ads above the fold. Tightening Authorship: About a 15% reduction. They found that when they reduce the amount of Authorship they show they are improving the quality. Rich Snippets may depend on site quality: If you’re a reputable site then they’ll trust Rich Snippets on your site. Brett Tabke of Pubcon asks Matt if he heard what Jason Calacanis said at his keynote yesterday. Matt says this is not a wrestling match, the search industry shouldn’t want Matt and Jason to fight. Matt has huge respect for Jason and how he calls it like he sees it. But he’ll try to give context. Jason said that “a lot of babies got thrown out with the bath water.” The changes could have been rolled out slowly and some warning could have been given to publisher partners. Matt shows that in 2011 a lot of people were calling Google out for not being on-top of a spammy content situation. Google had been working on content quality for a long time but everyone decided to get angry at once. He points to half-dozen articles from people like Read Write Web and Kristina Halvorsen complaining about content farms and content targeting long-tail queries producing junk content in results. Mahalo’s content was included in calls out. For Mahalo, just because they were a partner doesn’t mean they got advanced notice about what Google’s doing to improve search. And it’s hard to go into a meeting with a passionate business owner and tell them that their site is one of the most blocked sites in a Chrome add-on. When you talk about Google+ signals you always talk about +1s. What about sharing a link or shares? He talks about +1s a lot mainly because it’s emblematic of the social behavior. The broader picture is the same. It’s still short-term for social signals, but he’s bullish about the long-term social effect in identity. Infinite scrolling is more common; can you address it? It’s tricky, it’s like a calendar in that Googlebot could keep crawling all the way to the year 3000. You may want to think about having some kind of paginated interface where people can scroll through. You want to build in safeguards because even if Google does well, there’s still smaller search engines. How can a small site build authority? Go back to basics. A blog, a forum. Writing unique descriptions, more catchy and compelling. Anything creative. Think of the last 5 things you shared on Facebook or Twitter and those are the kinds of catchy content that builds authority. Can citations or mentions in PDFs like an ebook add authority? He’s not taking this off the table but says Google would be suspicious of this because spammers would use this. You have summarized it very well. Thank you, Virginia. This is the most informative summary of the conference that I have found. Happy to be of service, Aditya. Thanks Virginia very great post.